Dried beans and rice are a staple topic of discussion on this site because we’re all interested in knowing about food that has a long shelf life period and can be stored in bulk. Well I’m here to tell you about a dried food that has a shelf life comparable to rice and with even more nutritional value than brown rice. This is a food you’ll most certainly be interested in incorporating into your survival plans and into everyday life. I came across Quinoa because of my girlfriend. She used to be a vegetarian and is very nutritionally aware and was always looking for ways to be healthier. Knowing that her vegetarian diet was lower in protein, she discovered Quinoa as an amazing addition to her diet for its complete protein and amino acid boost compared to alternatives such as brown rice. Quinoa actually has almost double the amount of protein and double the amount of dietary fiber when compared to brown rice, which is quite impressive. 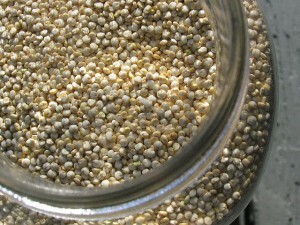 If you purchase processed Quinoa in the store it will only need a quick rinse, whereas a less processed version will need more soaking beforehand to remove the bitter outer casing called the Saponin. We typically use Quinoa the same way that we would use rice; it’s almost a direct substitute. Mix 2 cups water or stock with 1 cup of Quinoa and bring to a boil before lowering to a simmer. The final product has a mild flavor and is a delicious base for stir-fry, vegetables or whatever your fancy may be. There isn’t too much more I have to add on the topic. I am not an expert on the food source, but thought the readers of this blog would be very interested to read the basics I’ve provided in this article and do a little investigation of their own into this “super food.” It tastes great, stores well, and has fantastic nutritional value. What else do you need? Cooper Elling is passionate about camping, fitness & blogging. When he’s not working out, he writes about Sono Bello, cooking and hacky sacks. Note from Angela: Quinoa can be purchased in local health food stores or online from companies like Thrive Life. The nutrition in quinoa make it a winner. Okay, I will try this one more time. I bought quinoa at the grocery store in order to make my diet better.I love oats and brown rice. So, I figured quinoa would be easy. NOPE, I hated it even after several tries. First I ate it plain; then I ate it cooked in chicken broth; then I tried it with sugar. Your high praise will have me out buying more this weekend. The chickens looked at it suspiciously when it was cooked. Finally, I dumped the rest of the box into their pen and they gobbled it right down. I must say it smelled funny. Is it possible the box was spoiled? Great, persuasive post! Ooops! I did not mean to sound so negative on a guest post. But, I am glad to hear his advice so I will buy more and see what was wrong with the first or maybe change my tastes and attitude. I’m not a big fan either. It tastes a bit *grassy* to me, not a favorite. But it has been easy for me to grow. I got my seeds from Baker Creek Heirloom Seeds. I also bought it in bulk from WinCo…pretty inexpensive…My chickens like it too! Lynda, you are the first person that has expressed a dislike for quinoa. I think I might dump some in vegetable soup next time I make it–this fall. Oh, I might grow it for the chickens. I just posted about my first attempts at sprouts today. My three hens won’t eat sprouted pinto beans. Bummer. I like inexpensive food. It’s also creepy how it looks like little worms when cooked. Yeah I was extremely hesitant at first myself. As I said, my girlfriend was into it so I gave it a shot. While I don’t enjoy it as much as, say, Jasmine Rice with my stir fry, the nutritional values aren’t comparable. If you were to eat it without much going on, it’s not amazingly tasty. I typically put delicious stir fry’s or saucy sauteed vege medleys on top so that the quinoa is only a healthy filler. If you put a plate of it alone in front of me, I agree, nothing to write home about. Thanks for the posting. Now that I know about the protein, I will give it a try. Also nice to know someone is growing it…will look into that also – always room in the garden for something new! My Costco carries a 2lb bag for about $9. I have also tried quinoa, have 2 lbs, so far. In addition, I have started storing “canahua”, which is described as a cousin to quinoa. Canahua has 17% more protein and less fat. I’m trying to have lots of variety in the types of grains, beans, lentils, and dehydrated veggies that I am storing. While I have a high personal tolerance for eating the same thing over and over, I’ve read that too much of the same thing can create an allergy to it eventually, as well as use up all your digestive enzymes for processing that particular food. My fave way to eat it is as a hot breakfast cereal- either the flakes or whole quinoa, with a handful of raisins cooked into it- I use the microwave to cook it, mostly because I am a tad lazy. Add a small pat of butter to the top of the cereal in the bowl, then a bit of almond milk, and yum! I love the texture- slightly crunchy, even when cooked. What a delight compared to other hot cereals. I buy Quinoa in bulk at Costco! It costs me $9.99 for 4 pounds of Organic Quinoa! 1) It’s not brown or white rice. Though it’s cooked the same, it’s not the same! Once you accept this, it makes it a little easier to love the seed (that’s right, it’s not a grain!). 2) I LOVE quinoa as a breakfast cereal! Just make some quinoa at night (I cook mine in a rice cooker!) and leave in the fridge overnight. In the morning, scoop out the quinoa into a bowl, top with cinnamon and pour some milk in- voila! You have an extremely nutrient dense breakfast cereal without all the unhealthy sugars or processing! I suggest trying different toppings, such as adding honey or berries! My hubby loves it with peaches and cinnamon! 3) I love making tacos with quinoa! You can add quinoa anywhere. It’s a healthy filler! Did you know that quinoa was considered a sacred crop by the Incas and, more recently, has been classified as a “super crop” by the United Nations because of its high protein content. It is a complete protein, which means it contains all of the nine essential amino acids. Qunioa is a good source of copper, iron, magnesium, manganese and phosphorous which is why I included it in my list of Superfoods. I love quinoa. As for the smell… even pre-rinsed grains need to be thoroughly rinsed before you cook them. After rinsing, I find that soaking for a few hours in water, just like you would beans, really improves flavor and digestibility. Skimming off scum/bubbles as it cooks is very helpful. Also, I cook mine until it is very soft. My picky eaters will eat it when paired with cheddar cheese and onions. Costco has a great price on the Truroots brand, which is made in a certified gluten free facility. Hope that helps! I love quinoa. My family can’t stand it. So, to get around their great dislike of the grain, I cheat: since it cooks in about the same amount of time as rice, I substitute about 1/4 cup quinoa into my rice when I cook it with seasonings (blends well into Spanish rice — use 1/4 cup quinoa + 3/4 cup long grain rice). They haven’t complained — it was a good way to “use up” that box I bought when they first complained. I’m not telling them I’m buying more for long-term storage, though. Not yet, anyway!